Its that gorgeous time of year again, the leaves are abandoning their motherly trees, the woolly hats and scarves are donned, fires are lit and time is spent being cosy with loved ones. Autumn/Fall is finally here!! So, it is with great honor that we bring to you today, We See It | Vol 7 - The Autumn/Fall Issue! This issue was very special to us. Not only is it our one year anniversary but we had a very special guest designer work with us on this issue. Kat Banay is a photographer and designer from the Philippines. Featured in our very first issue, she was actually one of the first people picked to be in We See It. Her work is inspiring, she excels in portraiture and wedding photography and her travel shots are the type to make us all jealous (and now we want to visit the Philippines - real bad!!) We are thrilled to have had the chance to work with her and hope she has had a wonderful experience at We See It. Once again we are happy to bring you this issue packed full of art, fashion, imagery, poetry and stories, we would like to thank you all for submitting, meeting the deadlines, your correspondence and of course the readers - you all are amazing! Please feel free to share this publication on your sites, and networks. Please visit all the artists involved and show the love! Lastly, the last year has been great and we have showcased some of the best emerging and established artists out there and have loved every minute. 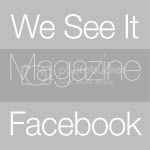 We have decided that We See It will now become a quarterly magazine as the workload for the bi monthly issues has become so huge. Our quarterly issues will be bigger and better than before and we are excited to get started next year.